In spite of the recent decline in oil price, rig count, drilling permits and well completions, with an estimated 1.284 Bb of production in 2015, Texas is expected to break historical records for crude oil production. 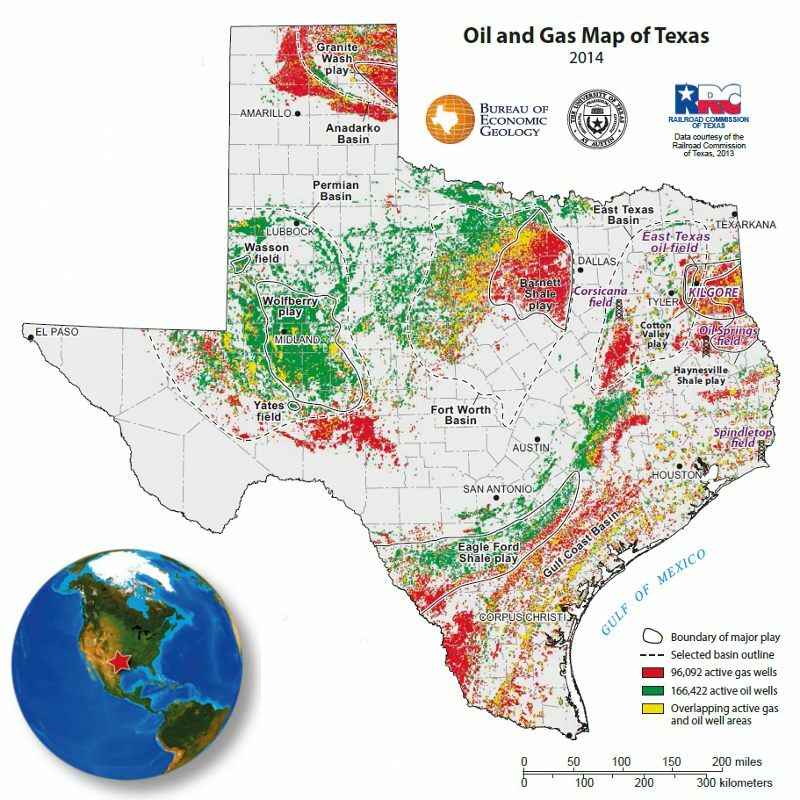 Oil and Gas Map of Texas 2014. (Source: Bureau of Economic Geology) Crude oil production in America’s No. 1 oil-producing state is projected to reach an all-time high in 2015. The old record of 1.263 Bbo in 1972 will be surpassed this year with an estimated 1.284 Bb. Oil production growth has increased and continues to rise at rates never recorded in the US over such a short period. 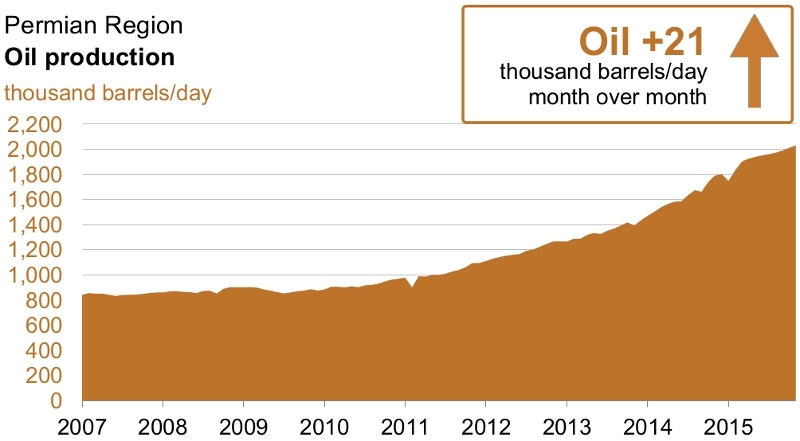 The September daily average oil production has more than doubled over the past three years. This is all in spite of the recent decline in oil price, rig count, drilling permits and well completions. According to the Texas Railroad Commission, Texas recorded a record monthly average daily oil production of 3.4 MMb in 1972. Production then went into a slow decline, and a more accelerated decline in 1981. The production slide continued until 2008 when hydraulic fracturing and horizontal drilling into shales and other tight formations started the steady turnaround. From what started out as just 10 bpd at the Westbrook Field in 1920, followed by the discovery of the supergiant Yates Field in 1926, the Permian Basin had become one of the world’s great petroleum basins. Daily production peaked in 1973 at 2.085 MMbopd just a year after the state’s peak in daily production. The decline was slowed by enhanced recovery and infield drilling. Permian Basin shale plays have led to an average gain of 21 Mbopd month to month over the past four years. (Source: EIA) The recent meteoric rise in production started in 2011 when companies began targeting the unconventional oil plays in the older strata. The Wolfcamp, Cline shale, Strawn and Atoka became targets below the traditional producing horizons and represent a thick section underlying much of this 400 km-wide by 480 km-long basin. According to the US Energy Information Administration (EIA), average daily production for October 2015 was 2,012 Mbopd and is projected for November to be up to 2,033 Mbopd, keeping the 21% monthly change that has been going on for almost four years now. Also from the EIA, since 2011 the rig count was between 450 to over 550 in 2014, and has dropped to just over 200 in less than a year, yet production continues to climb. New well production has risen almost as fast. In 2011, production from new wells was approximately 100 bopd and has risen steadily to 230 bopd in late 2014, then continued with a rapid rise to the current 550 bopd. Simply put, the companies have started targeting the higher productive trends and have learned better completion techniques. 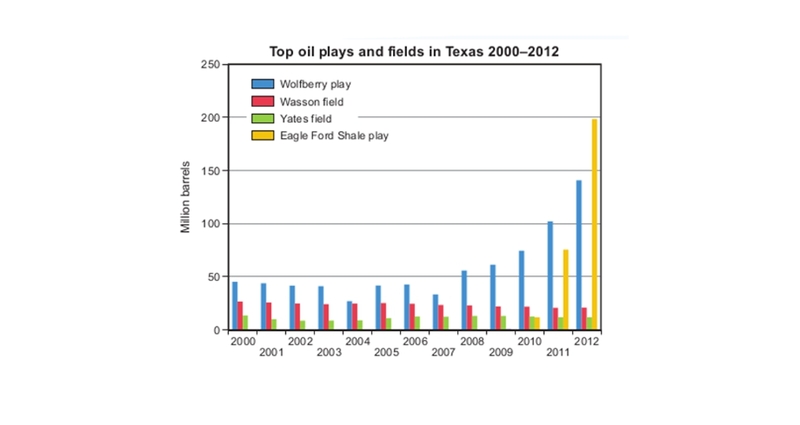 Looking at the rise in the other giant shale oil play, the south-west Texas Eagle Ford, oil production started in earnest in the middle of 2010, after three years of drilling with little improvement in production, which stayed under 100 Mbopd. After 2011, production from the formation nearly doubled every year, reaching 1,059 Mbopd in 2014, according to the Railroad Commission of Texas. Through July 2015 the production increase has slowed, averaging 1,073 Mbopd, and an EIA report has production slowing in the second half of 2015. As in the Permian Basin, the rig count has dropped off precipitously from approximately 250 in late 2014 to 100 in mid-2015. In addition, new well oil production per rig has increased from under 100 bopd to close at the current 800 bopd, indicating a long and laborious learning curve to these types of plays. 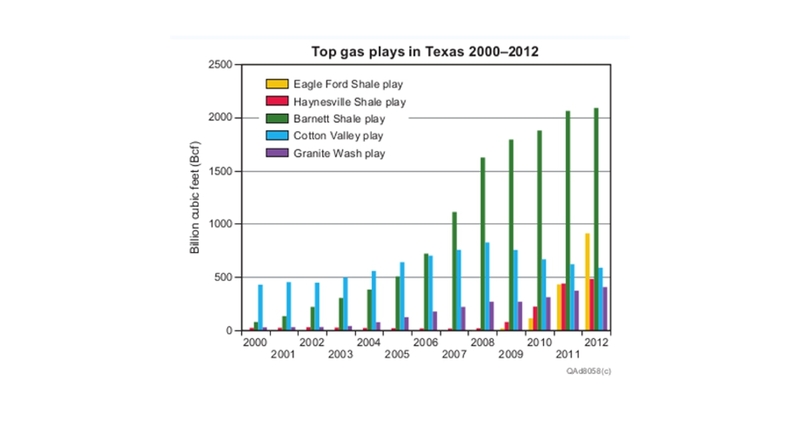 New trends in Texas could include the Pearsall and Buda plays located below the Eagle Ford. Activity started in these plays before the oil price drop and showed promise in depths varying from 2,130m to 3,800m. Other Eagle Ford equivalent plays being targeted in south-east Texas include the Lower Woodbine and the Eaglebine, located on the eastern edge of the Eagle Ford. Close to the Barnett shale play in North Texas operators are looking at the Marble Falls play that overlies the Barnett. This 122m-thick play has had over 300 successfully completed wells by companies such as EOG and Pioneer Natural Resources Corporation. Further north in the Texas Panhandle is the Granite Wash play and other shale plays overlying the Granite Wash, extending further west. These are oil prone and shallower than the Granite Wash play. Finally, companies have only scratched a small portion of the Permian Basin. This area is actually divided into the Midland Basin and the Delaware Basin, separated by the Central Basin platform. The equivalent formation names change across the two basins but they seem all to be oil charged. There are also multiple intervals within these shales that are separate plays, which companies are just beginning to explore. Once oil prices start up again, and with all the shale potential remaining in the state, Texas oil production could increase to even higher levels than seen before.